Issues in Stimulus-Response Compatibility. Things That Go Together: A Review of Stimulus-Response Compatibility and Related Effects (E.A. Alluisi, J.S. Warm). The Effects of an Irrelevant Directional Cue on Human Information Processing (J.R. Simon). Mental Representation. Spatial Stimulus-Response Compatibility (C. Umiltá, R. Nicoletti). Spatial Coding and Spatio-Anatomical Mapping: Evidence for a Hierarchical Model of Spatial Stimulus-Response Compatibility (G. Heister, P. Schroeder-Heister, W.H. Ehrenstein). Some Aspects of Spatial Stimulus-Response Compatibility in Adults and Normal Children (E. Ládavas). The Salient-Features Coding Principle for Spatial- and Symbolic-Compatibility Effects (T.G. Reeve, R.W. Proctor). Psychophysiological Indices and Neurophysiological Mechanisms. Stimulus-Response Compatibility Viewed from a Cognitive Psychophysiological Perspective (T.R. Bashore). Cerebral Evoked Potentials: Early Indexes of Compatibility Effects (R. Ragot). 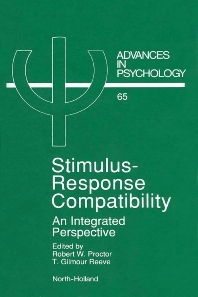 Psychological and Neurophysiological Factors in Stimulus-Response Compatibility (J. Brebner). Attentional Processes in Spatial Stimulus-Response Compatibility (M. Verfaellie, D. Bowers, K.M. Heilman). Motor Performance. Stimulus-Response Compatibility and the Programming of Motor Activity: Pitfalls and Possible New Directions (H.N. Zelaznik, E. Franz). Response Selection and Motor Programming: Effects of Compatibility and Average Velocity (W.A.C. Spijkers). Rapid Responses with the Left or Right hand: Response-Response Compatibility Effects Due to Intermanual Interactions (H. Heuer). Perceptual-Motor Processing in Speech (P.C. Gordon). Applications to Human Factors. Stimulus-Response Compatibility and Human Factors (B.H. Kantowitz, T.J. Triggs, V.E. Barnes). The Mental-Model in Stimulus-Response Compatibility (R.E. Eberts, J.W. Posey). Towards an Engineering Model of Stimulus-Response Compatibility (B.E. John, A. Newell). An Integrated Perspective. Research on Stimulus-Response Compatibility: Toward a Comprehensive Account (R.W. Proctor, T.G. Reeve). Indexes. Stimulus-response compatibility refers to the finding that certain mappings of stimuli to responses produce faster and more accurate responding than do others. The present volume surveys compatibility research which falls into four broad categories: (a) mental representation and coding (b) neurophysiological mechanisms (c) motor performance (d) human factors applications. The major findings and models within each of the categories are summarized, and an integrated perspective is provided. The research indicates that compatibility effects reflect basic cognitive processes that bear on a range of issues in cognitive science and that have applied implications for human factors specialists.